If you are serious about learning more about Beekeeping why not join the basic beekeeping course which John Hoar is organising beginning in January 2019? 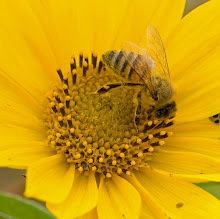 The National Honey Monitoring Scheme is a long-term programme set up in 2018 that will use techniques to identify plant DNA and measure environmental contaminants, such as pesticide residues in honey produced in the UK. All amateur and professional beekeepers are asked to register their interest in taking part by emailing the Centre for Ecology and Hydrology (CEH) honey@ceh.ac.uk. The viability of the monitoring scheme will depend upon sufficient numbers of beekeepers expressing an interest in participating. A pilot study identified widespread residues of neonicotinoid pesticides in honey samples collected from BBKA members across the UK. I took part in this pilot study and sent a sample of my honey to CEH in 2015, the analysis of which found imidacloprid (a neonicotinoid). The location of my apiary is close to commercial glass houses and a PYO farm, although it might have been picked up elsewhere.